If you have anxiety or suffer from panic attacks, little things like driving, being at a party where you don't know anyone, or even going to the grocery store can seem overwhelming. But these little things are a part of everyday life, and if you try to avoid them, you may end up feeling alienated, lonely, and unfulfilled. Furthermore, simply avoiding anxiety-causing situations will not help you to conquer your anxiety. If anything, it can make it worse! So how can you take control of your anxiety symptoms, once and for all? 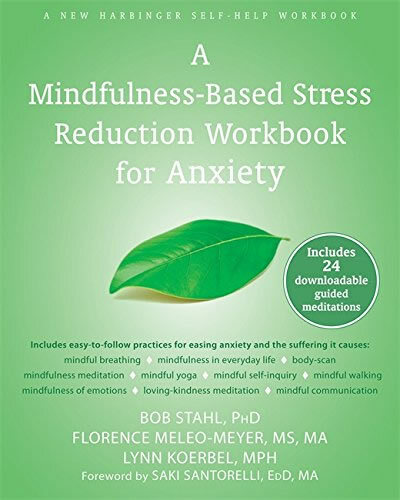 In The Mindfulness-Based Stress Reduction Workbook for Anxiety, three mindfulness-based stress reduction (MBSR) experts provide mindfulness meditations and exercises to help sooth anxiety, understand common triggers, and live more fully in the moment. Developed by Jon Kabat-Zinn, MBSR is a powerful, evidence-based treatment model that fuses mindfulness meditation and yoga, and has been proven effective in treating a wide range of chronic disorders and diseases. The mindfulness practices in MBSR help you to cultivate a greater awareness of the connection between your body and mind, and can help you identify and move past the toxic thoughts, feelings, and behaviors that lie at the root of your anxiety.